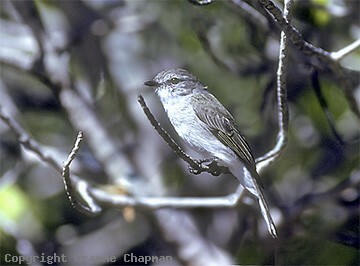 The Brown-tailed, or Kimberley Flycatcher is currently regarded as a subspecies of the Lemon-bellied Flycatcher. It is found almost entirely in mangroves around the Kimberley coast of Western Australia, from Broome around to Cambridge Gulf. 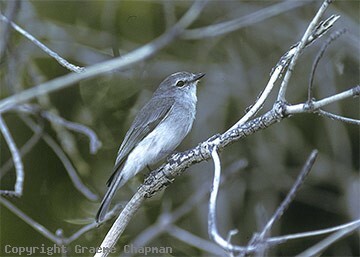 At Ningbing north of Kununurra there are birds showing a little yellow on the belly, presumed intermediates between Brown-tailed and Lemon-bellied Flycatchers. This hybrid form is illustrated in Vol II page 167 of the excellent Handbook of Western Australian Birds. I photographed these birds in the mangroves at Barred Creek, just north of Broome where I found two pairs fairly easily in the more open White Mangrove, Avicennia sp. (pic 378206) where they spent most of their time in the outer foliage, sallying forth to catch insects. 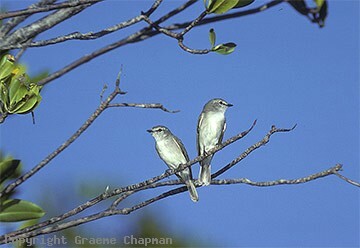 According to John Young, these birds build the smallest nest of any bird in Australia. They lay only one egg. Barred Creek is an excellent place to chase mangrove inhabiting birds. The sandy, rather than bottomless muddy base there allows easy walking - just don't get lost or caught by the incoming tide! 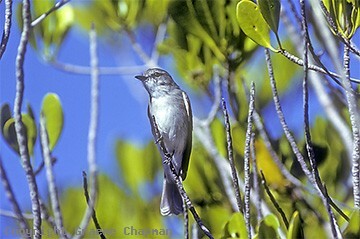 378201 ... Brown-tailed (Kimberley) Flycatcher, adult pair.